Check out the upcoming U.S. Assembly of Jews: Confronting Racism and Israeli Apartheid, organized by the International Jewish Anti-Zionist Network and US Campaign member group Middle East Children's Alliance.
" The 2010 US social Forum comes at a time when there is great urgency to build on recent successes of the Palestine solidarity movement, as United States corporations and the government continue to commit grave injustices in Palestine- not to mention in our own communities. 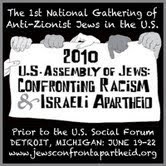 Organized anti-Zionist Jews in the United States can play a critical role in movements with anti-racism and anti-imperialism at the center, and building stronger international solidarity. Come together with other anti-Zionist Jewish activists committed to challenging racism, colonialism and imperialism- first and foremost by contributing to efforts to overcome Zionism and decolonize Palestine. Build a shared direction and shared strategies for anti-Zionist Jewish organizing in the US, and build a relationship across locations for our organizing efforts. Advance the Palestinian call for Boycott, Divestment and Sanctions including: campaigns against the Jewish National Fund; citywide to statewide divestment and boycott campaigns; labor divestment from Israeli bonds and the Histadrut, Israel's founding labor Zionist organization. Develop anti-Zionist Jewish political perspectives and analysis, art, culture, and spiritual practice against Zionism's attempt to erase or co-opt our multiple social, cultural and political histories. "